For other places with the same name, see Zarechny. 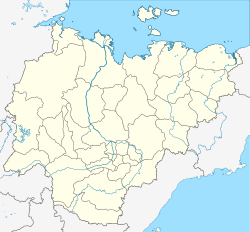 Zarechny (Russian: Заречный) is a rural locality (a selo), the only inhabited locality, and the administrative center of Zarechny Village of Olyokminsky District in the Sakha Republic, Russia, located 3 kilometers (1.9 mi) from Olyokminsk, the administrative center of the district. Its population as of the 2010 Census was 620, of whom 327 were male and 293 female, down from 674 as recorded during the 2002 Census. ^ a b This figure is given for Zarechny Village, a municipal formation of Olyokminsky Municipal District. According to Law #173-Z 353-III, Zarechny is the only inhabited locality on the territory of this municipal formation. This Sakha Republic location article is a stub. You can help Wikipedia by expanding it.